"The Glass Flowers" tells the story of Lalita Khatoun, a young mortal girl who is an orphan being raised by her aunt and uncle, and who has lost her only brother Kholi, a traveller. Lalita is a very talented and humble writer and illustrator who has the honor to commission an illustrated copy of "A Thousand and One Nights" for the Sultan Mohan. In a tragic turn of events foreseen by fate, Lalita is sold to the Grand Vizier by her evil Uncle Kurdeesh to work in a harem, the royal Seraglio. Lalita becomes one of the odalisques for the Grand Sultan while also working on her illustrated works for "A Thousand and One Nights". Finnian, a Faeran, also known as an Other, possesses magick powers and was reared by his evil grandmother, Isolde, and after unsuccessfully trying to poison the old woman, Finnian is on the run to try to escape from her wrath. With a mission in mind, Finnian seeks to destroy his grandmother and in the process destroys the Cantrip of Life, a secret charm that his grandmother wishes to possess. In a twist of fate, the young Lalita and Finnian are destined to meet and fall in love. Both of them are bound together to solve the mystery of each of their brother’s demise while seeking to destroy and rid the world of the Cantrips and thereby saving all of humanity. 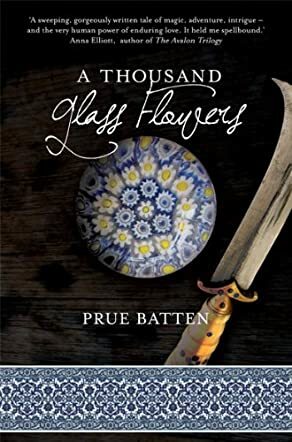 This very well-written fantasy tale of "The Glass Flowers" by Prue Batten is one filled with extreme tragedy, heartbreaking sorrow, love and redemption. I feel that author Prue Batten does a good job of making the two worlds of Lalita and Finnian come alive. The two young souls, woven and linked together forever by chance, and with both of their destinies paving the way, discover the link between the kindred friendships of both of their brothers who had been taken away from them by happenstance and fate. Her very flowery and descriptive words ebb and flow beautifully making her literary work leap and dance off the pages. The two very distinctive worlds of the Faeran Others with their world filled with magick, sprites and otherworldly spirits, equally divides and shares a place within the mortal world of Lalita’s. The despair and the sorrow felt by both of the protagonists is a believable one where one’s destiny also truly lies in the hands of fate. I recommend this fantasy book to all readers who enjoy their love stories filled with hope and magic. This is a story that you will not easily forget and one that will touch the depths of your hearts. Lalita Khatoun was an extremely talented Scribe. Her cruel and lecherous uncle sold her to the Grand Vizier for the Sultan’s harem. She hated her uncle and if she could, would have killed him. Lalita reminded herself to concentrate on the beauty of her surroundings rather than her captivity. She could see and converse with an afrit (an evil demon). The other women were sure she was mad when they heard her talking to someone they could not see. Lalita had caught the eye of the Sultan placing danger on her life. Finnian was ripped from the side of his twin brother Liam at birth and raised by his cruel grandmother. Punishment after punishment brought scars; the ones on the inside were the deepest. He found the opportunity to kill her with a poison. The death took two long painful days but no one really cared. Her death was his only escape from the old witch. Disguised as a longshoreman he sailed toward his freedom. Or did the old witch survive? Finnian told a lie while on board the ship. He considered it a game but it led to the death of a man. "A Thousand Glass Flowers" is an entertaining read. The title is intriguing; it refers to paper weights that in this instance hold the spells that both Finnian and Lalita seek. Prue Batten combines magic, romance, revenge, and regret. This tale reads much like an old fable or fairy tale. I found it delightfully entertaining. Toward the end of the book Finnian must play a game of shatranj but his life may never be the same whether he wins or not. Fantasy fans, don’t miss out on this one.